By Corinne Goria. 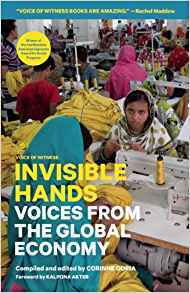 A collection of oral histories revealing human rights abuses occurring behind the scenes of the global economy — at phone manufacturers in China, copper miners in Zambia, garment workers in Bangladesh, and farmers around the world — showing how lives and communities are devastated by low wages, environmental degradation, and political repression, capturing the inter-connectivity of all people struggling to support themselves and their families. Learn more.